New Japan Pro-Wrestling is having one of the hottest streaks in the history of wrasslin’ right now. The roster is one of the most stacked ever seen, featuring a litany of performers that can have a fantastic match any given night in just about any combination. And fans outside Japan are taking notice in increasing number, with each successive Wrestle Kingdom and G1 getting more buzz overseas than the one before. NJPW has been on a roll for years, but much of the credit for this growing international audience goes to one of the company’s top guys, Kenny Omega. The Canadian-born performer has been wrestling for more than a decade, and he’s never been hotter than right now. Following two matches against Kazuchika Okada that shattered Dave Meltzer’s five-star wrestling ratings, Omega became NJPW’s first ever IWGP US Heavyweight Champion during the promotion’s first US shows earlier in July. After the big night, Omega was reflective on his big moment. “It was an incredible energy on both nights, especially on night two,” he told Paste. The Cleaner takes the risk and lights up the crowd! Everything is on the line! Omega made special note of the 2,000 folks who immediately sold out the southern California venue. “I had high hopes that we'd create a party-like atmosphere, but the fans went above and beyond to blow away everyone's expectations,” he said. “It's awesome that people all over know and enjoy our product. It's huge motivation for me to push for a way larger venue next time.” Omega echoed those sentiments right after his win, though in-character boasting that they could've filled 20,000 seats easily. 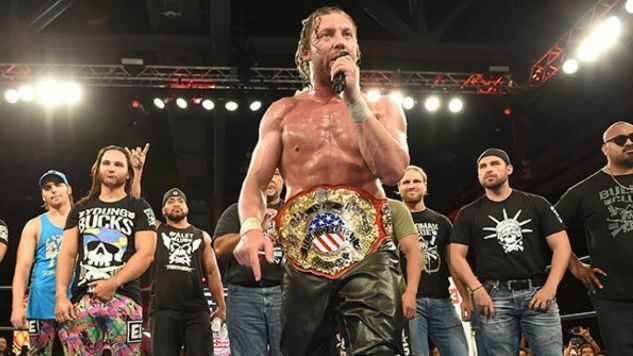 After his big win, many wondered if Kenny Omega will be showing up at Ring of Honor or other international promotions to defend his gold, and it looks like that’s on his mind as well. Just today it was announced that he would be defending his US Heavyweight title at Ring of Honor’s Global Wars show in Chicago on October 15. But first Omega has to survive the grueling G1 Climax tournament that’s seen some of the best wrestling all year. Kenny Omega is the first non-Japanese person to win the G1 tournament, the first to receive a six star match review, and New Japan’s first ever United States champion—and the year’s barely half over. Who knows what other impossibilities he’ll accomplish before 2018 begins?